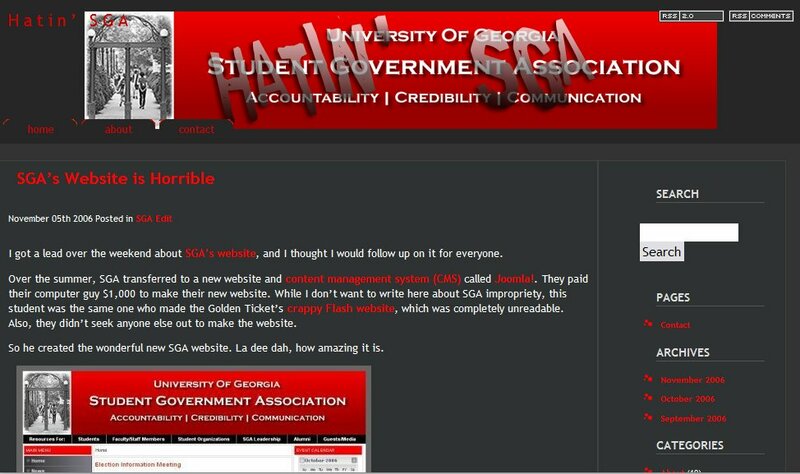 Mentioned in the UGA independent student newspaper, the Red and Black, today for my work at Hatin’ SGA, the anti-student government website. 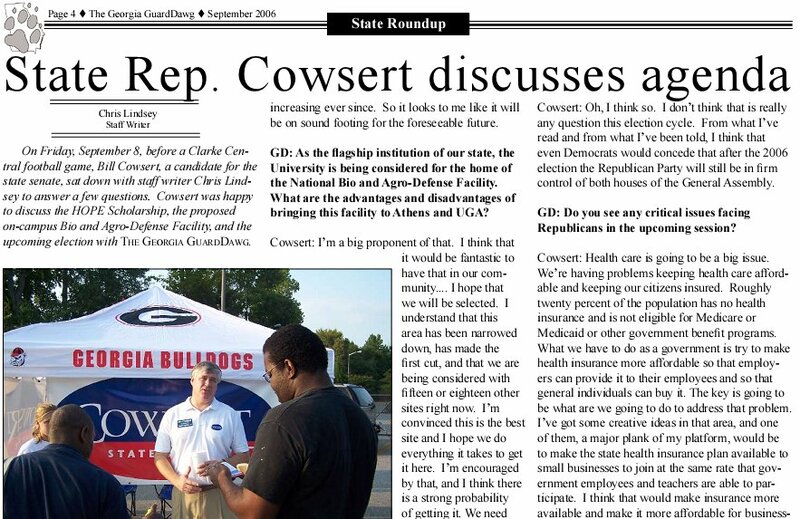 Chris’ first ever news article was printed in the September issue of The Georgia GuardDawg, the independent conservative newspaper of the University of Georgia. 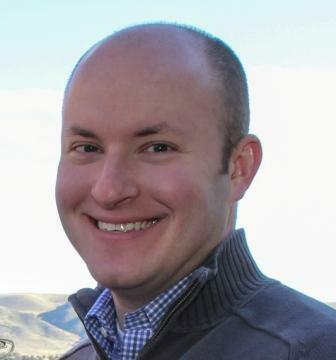 He interviewed State Representative Bill Cowsert, who is running for on of the State Senate seats that represents the Athens-Clarke County area. See the pdf here (State Rep. Cowsert discusses agenda, page 4). On Friday, September 8, before a Clarke Central football game, state representative Bill Cowsert sat down with staff writer Chris Lindsey to answer a few questions. Cowsert was happy to discuss the HOPE Scholarship, the proposed on-campus Bio- and Agro-Defense Facility, and the upcoming election with the Georgia GuardDawg. GD: You are running to replace Sen. Brian Kemp, a staunch defender of the HOPE scholarship. Do you plan to carry that torch, and if so, what are the current problems facing HOPE? How do you think we should address them? Cowsert: Absolutely. I think that is one of the major planks in my platform. I was very disappointed this year when the HOPE Chest Amendment that Governor Purdue proposed – a constitutional amendment that would protect the HOPE scholarship funds, along with Pre-K funds – failed largely due to Democratic opposition. This was very disappointing to me, especially since Jane Kidd also opposed that amendment. GD: Do you see any problems with HOPE Scholarship? Cowsert: I think it looks like HOPE is on a pretty sound footing now. A couple of years back, Rep. Louise McBee was actually the head of a commission to help protect the HOPE Scholarship. The commission tried to make some provisions to make sure it would be fiscally sound in the future. I think the changes they implemented apparently worked well because actual revenues from the lottery have been increasing ever since. So it looks to me like it will be on sound footing for the foreseeable future. GD: As the flagship institution of our state, the University is being considered for the home of the National Bio and Agro-Defense Facility. What are the advantages and disadvantages of bringing this facility to Athens and UGA? Cowsert: I’m a big proponent of that. I think that it would be fantastic to have that in our community. I think that what we can offer in this area, with the University of Georgia and the other industry and work-force we have here, would be ideal for that type of industry. I hope that we will be selected. I understand that this area has been narrowed down, has made the first cut, and that we are being considered with fifteen or eighteen other sites right now. I’m convinced this is the best site and I hope we do everything it takes to get it here. I’m encouraged by that, and I think there is a strong probability of getting it. We need to work as a community and as a region to try and get that here in Athens. GD: Recently there has been a controversy on campus involving several Greek houses being forced to move off of Lumpkin Street. Athens-Clarke County has blocked those fraternities from relocating off-campus. What are your thoughts? Cowsert: I don’t really think that will be dealt with at the state level and in the Georgia Senate. From what I’ve read recently it sounds like the University is reaching out and trying to make arrangements and accommodations for the fraternities who are being displaced from their housing to be able to move out onto River Road. I trust that both the Clarke County government and the University of Georgia will do what they can to help accommodate the students. I hope that all works out for everybody involved. GD: Do you think Republicans will keep control of the Georgia General Assembly after the elections this November? Cowsert: Oh, I think so. I don’t think that is really any question this election cycle. From what I’ve read and from what I’ve been told, I think that even Democrats would concede that after the 2006 election the Republican Party will still be in firm control of both houses of the General Assembly. GD: Do you see any critical issues facing Republicans in the upcoming session? Cowsert: Health care is going to be a big issue. We’re having problems keeping health care affordable and keeping our citizens insured. Roughly twenty percent of the population has no health insurance and is not eligible for Medicare or Medicaid or other government benefit programs. What we have to do as a government is try to make health insurance more affordable so that employers can provide it to their employees and so that general individuals can buy it. The key is going to be what are we going to do to address that problem. I’ve got some creative ideas in that area, and one of them, a major plank of my platform, would be to make the state health insurance plan available to small businesses to join at the same rate that government employees and teachers are able to participate. I think that would make insurance more available and make it more affordable for businesses so that they would be encouraged to provide it to their employees. Ultimately it could help to reduce our health care costs across the board. From what I hear, there is also a strong trend to fully fund the educational system, all the way from K-12 as well as higher education. For the last two years we have fully funded the higher education end of things. There have also been great increases in the funding of K-12. I think this past year’s budget allocated $700 million out the additional $1 billion in revenues towards education, largely to teacher pay. That’s where I think the money ought to be spent, in the classroom, and I think it’s vital that we keep teachers with longevity and experience and reward them for their service.